The death toll in an attack on Friday on a mosque in Egypt's North Sinai province rose to 235, Egypt's state TV reported. At least 109 others were wounded when suspected militants attacked the mosque, the report said. Earlier report said at least 115 people were killed in the attack. 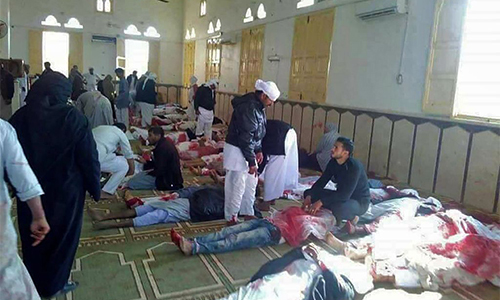 An explosive device planted outside the mosque near Arish city went off, before militants opened fire at the prayers, an official security source told Xinhua. The attack occurred in the village of Rawda in Beir el-Abad, 40 km from Arish, the source added. Some 50 ambulances rushed to the scene after the attack. Most of the wounded were transferred to the Arish Hospital for treatment. Egyptian President Abdel-Fattah al-Sisi will chair a meeting of the security committee on the attack, official MENA news agency quoted presidential sources as saying. The meeting will be attended by the ministers of defense and interior in addition to the heads of general intelligence and military intelligence services, the report said. The Egyptian presidency declared three-day mourning across the nation. The presidency in a statement condemned that terrorist attack as treacherous and heinous action that wouldn't be passed without punishment. "The pains that the Egyptians are suffering now wouldn't be overcome without strict response, and the hand of justice will reach all those took part in the attack," the presidency statement added. Egypt will continue its war against the black terrorism with hope and willingness and will uproot it, it added. Grand Imam of Al Azhar Ahmed el Tayeb denounced "the terrorist attack" stressing the importance of working to eliminate terrorists. Head of the European Union Delegation to Egypt, Ambassador Ivan Surkos, also condemned the attack. "Media bringing news on attack against mosque during today's Friday prayers in Rawda, Northern Sinai, reporting many injured," Surkos tweeted. "I condemn this barbaric terrorist act against innocent civilians," he added. Egypt is suffering a wave of terrorist attacks, mostly centered in Sinai where militants have killed hundreds of police and soldiers since the army-led ouster of Islamist president Mohamed Morsi in 2013. Most of the attacks, which recently expanded the city and some other cities, have been claimed by the Islamic State branch in Sinai.